Perhaps the most beloved pets of all time, many families across the country include a canine member in their household. Therefore, it’s no surprise that dogs star alongside their humans in a variety of films on the big and small screens. Which dogs are some of the most famous dogs in classic movies and TV shows? Not only was this big, fluffy collie beautiful, she repeatedly rescued child Timmy out of all kinds of dangerous situations. A truly courageous and loyal dog, Lassie was one of the most famous dogs when her show ran in the 1950’s. However, most of the dogs who played the character Lassie were actually male dogs. Male collies tend to have thicker coats that look better on screen. Unless you’ve been living in a vacuum your whole life, you’ve probably seen the 1939 film, The Wizard of Oz. As Dorothy’s beloved dog, she often toted Toto in a picnic basket. Played by a dog named Terry, this beloved canine appeared in 13 other films during his lifetime. Children and adults alike have been traumatized by the depressing tale of the doomed family mutt, Old Yeller. If you can’t watch the infamous Sarah McLachlan animal rescue commercial, do not watch this 1957 movie about the heart-wrenching loss people experience when they lose a dog. Chances are, if you grew up in the seventies or eighties, you’ve probably watched the 1974 movie, Benji. When a Hollywood animal trainer entered a shelter, he noticed that this dog displayed a wide range of expressions and emotions. He adopted the dog and named him Higgins, and just a few years later, the canine became a movie star. Lassie wasn’t the only small screen canine star of the 1950’s. A series of German shepherds starred as Rin Tin Tin, a dog who kept humans in line during the Wild West. This courageous dog could jump great heights, always taking down the bad guys. Did you ever watch the 1930’s TV series, The Little Rascals? This series chronicled the adventures of a band of mischievous boys and their dog, Pete. Played by American Staffordshire terrier Pal the Wonder Dog, this stocky dog had a unique ring surrounding his right eye. Unfortunately, Pal died before the TV series ended, so all future dog actors had to have a ring drawn around their right eye to appear authentic. Kids love the perpetually hungry and easily frightened Great Dane, Scooby Doo. Running from the 1960’s to present times, this animated series is beloved all across the country. Scooby Doo often accompanied his human friend, Shaggy as they attempted to solve mysteries, eating every snack insight along the way. 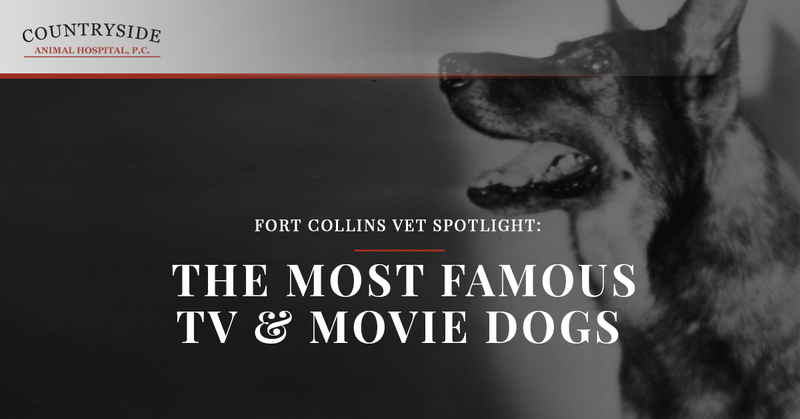 Your dog doesn’t have to be famous to visit our Fort Collins veterinary clinic. Our experienced veterinarians work with dogs of all sizes and breeds. Whether Fido needs his annual vaccines, dental care, diagnostic testing, digital x-rays or more, our animal hospital is happy to take care of your canine. Contact Countryside Animal Hospital today to make an appointment.